Last year Mr. Ramesh Gupta's car got involved in a fatal car accident and got severely affected. However, Mr. Gupta had his car insured comprehensively and claimed successfully the entire amount of Rs. 15 Lakhs as compensation from his car insurer. The incident mentioned above has long been the typical picture of claims being made on car insurance plans in India. An insured vehicle has been entitled to compensated to the actual amount of loss or damage. And, the liability of the car insurance companies in India, needless to say, has been endless. A seismic shift is very much on the cards when it comes to available coverage of comprehensive car insurance plans, especially in the aftermath of introduction of The Motor Vehicles (Amendment) Bill, 2016 in the Lok Sabha last month. The Ministry of Road Transport and Highways set up a group of 18 State Transport Ministers to recommend changes to the existing Motor Vehicle Act. The suggested amendment seeks to limit the insurers' obligation towards third party liabilities. According to the act prevailing now, the insurers' liability extends to the actual amount of third party liabilities in case of any accident. The bill on the making aims to keep the insurers' liability to a certain extent. In the event of death of third party the liability of insurers' is capped at Rs.10 lakh and Rs. 5 lakhs in case of third party physical injury due to accident. As of now, car-owners in India are rest assured of having their third party liabilities entirely covered. Any financial obligation sustained by valid policyholders due to death and disability of third party are covered in the policy. But in case of third party property damage, IRDA have already imposed an upper cap of Rs.750,000. And the same goes for personal accident coverage for driver or owner of the insured vehicle. The amount of compensation is determined by the nature of injury. For an instance, in the unfortunate event of death of the driver-owner, the compensation is 100% of the Sum Insured. It is very much likely that we are soon going to see a ceiling on third party accidental liabilities as well, much to the delight of car insurance companies in India. How Car-Owners Will Be Affected by The Proposed Third Party Liability Coverage? If the recommended limit comes into effect, third party victims of accidents will not get more than Rs.10 lakhs in the event of death and over Rs.5 lakhs for bodily injury from the insurer. Consequently, car-owners have to pay the rest of the amount to third party victims. Had this amendment taken place prior to the mishap of Mr. Gupta's vehicle, he had to pay a massive Rs. 5 Lakhs from his own pocket as his insurers would pay only up to Rs. 10 Lakhs in that case. Hence, from the perspective of common mass, the proposed amendment is worrisome indeed. In case the third party or its legal heirs make accidental claims before a court and get Rs 20 lakh claim amount approved, the car insurer in question would pay only up to Rs 10 lakh and the rest would become the obligation of the owner of the car who committed the accident. A Boon for Car Insurance Companies in India? Car insurance companies in India has always been on the lookout to limit their unlimited third party liability. And, the proposed amendment is well and truly made in the interests of the insurers. Owing to huge losses of car insurance companies in India, the IRDA decided to hike third party car insurance premium in all segments of cars and two wheelers. 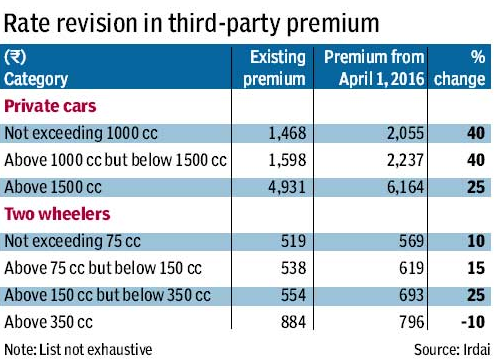 The third-party car insurance premium saw a whopping 40% hike for vehicles up to 1500cc from 1st April, 2016. Here is the revised premium rate for third party liability. According to the stats, the combined ratio was close to 200% in the motor insurance segment by the end of March 2015 due to higher number of claims and low-key growth in the third-party or TP segment and the companies found it immensely hard to run their businesses. With the 40% hike in TP premium the ratio has now come down to 140% now. And the much-awaited capping on TP liabilities will help car insurance companies in India make some profit finally. Is It Any Good for Car Insurance Policyholders? Experts in the industry predict that imposing a limit on TP liability claim will help reduce premium. They are also in the opinion that most of the TP claims are well under the proposed limit of Rs. 10 Lakhs so policyholders don't have to burn a whole in their pockets rather frequently. The proposed bill except for limiting insurers' liability towards TP claims, has also put forward many stricter policies to reduce road-mishaps. Less number of accidents will also decrease insurers' as well as policyholders' obligation towards third party liabilities. If there is no accident, there is no question of claim and out-of-pocket expense of policyholders consequently. 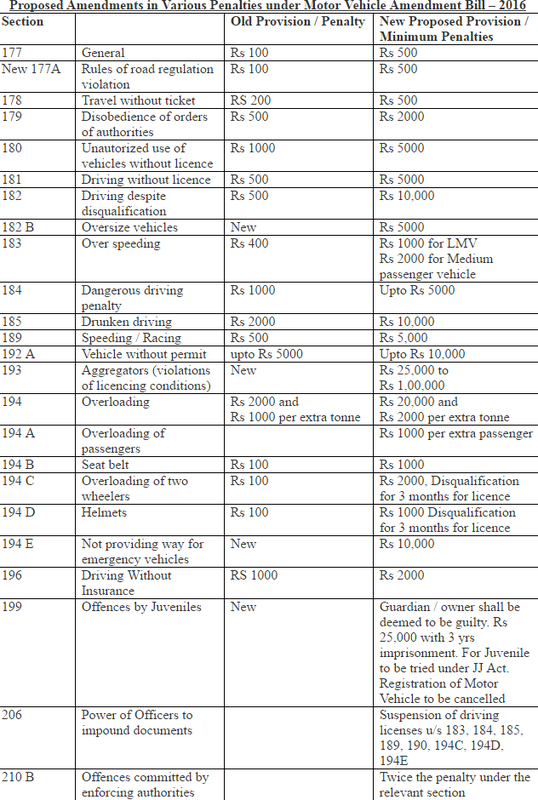 Here is the list of proposed amendment to promote safety on roads. The proposed bill also aims to simplify claim provisions and process of settling claims regarding vehicle accidents. At present, there are over 21 crore vehicle owners in India. And, if this bill turns out to be a law, they will have to face the ordeal of paying out accidental third party claim above Rs.10 lakh out of their pockets. The very purpose of availing insurance is to bypass the obligation of paying huge compensations in case of unexpected events. But, if the insured has to pay the third party claim amount, the intent behind making third party insurance mandatory will be defeated. The increased Third Party premium coupled with capped third party coverage will prove to be a nightmare for Indian vehicle owners. In India, 400 people die everyday in road accidents and number of injured person range in lakhs in a year. This staggering stats heightens vehicle owners' chance of getting involved in road-mishaps and paying hefty compensations in the process. Hopefully, the stricter policies to curb accidents will prove to be effective and vehicle-owners don't have to come across hefty third party claims hovering over and above the stipulated limit.